Microwave popcorn is convenient when you want freshly popped popcorn at home but don't have a popcorn popper. Unfortunately, due to the differences among microwave wattages and settings, your snack may burn, leaving you with a mass of charred, unappetizing lumps and a unpleasant smell that lingers in your microwave. You can clean and deodorize your microwave oven to get rid of the smell. A microwave sometimes burns popcorn. Fill a microwave-safe bowl with one cup of water. 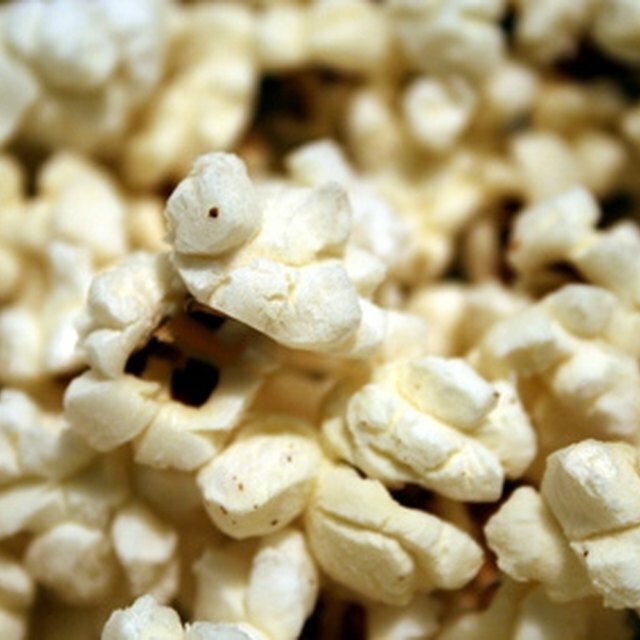 Add three drops of vanilla or lemon extract to the water to mask the scent of burned popcorn. Place the bowl of scented water in the microwave and close the door. Run the microwave on a high heat setting for five minutes or until the liquid develops a rolling boil. A rolling boil consists of countless bubbles consistently breaking on the surface of the water. Put on oven mitts to protect your hands from the hot dish. Remove the dish of scented water from the microwave and place it aside for a moment. Quickly remove and place aside the revolving tray from the microwave, if so equipped. Place the bowl of water back in the microwave and close the door. Allow the bowl of scented water to remain in the microwave for 10 to 15 minutes. Remove the oven mitts. Place a stopper in the sink, fill it with hot water and add four to five drops of liquid dishwashing soap to the water. Put on a pair of rubber dishwashing gloves and agitate the water to form soap bubbles. Place the microwave tray in the water and allow it to soak for approximately five minutes. Dip a dishcloth in the hot, soapy water and wipe the microwave tray with it to clean. Rinse the tray under warm, running water and dry it with a soft cloth. Place aside. Open the microwave, remove the bowl with scented water and place it in the sink. Squeeze the dishcloth to remove excess liquid. The cloth should be damp, not dripping. Wipe down the inside of the microwave with the hot, soapy dishcloth to clean any residue on the ceiling, walls or floor of the appliance. Dry with a soft, clean towel. Replace the revolving tray. After cleaning and deodorizing, leave the door to the microwave open for two to three hours to "air out" if needed. Be very careful when removing the bowl of hot water from the microwave. It will burn your skin if it spills on you. Is Water Heated in a Microwave Safe to Drink? What Is Making My Microwave Put Out a Smell Like Tuna?